The morning finds us at the orphanage again – this time with a load of tangerines for the children. And I do mean a load. Food is cheap here, remember? And an entire crate full of tangerines costs very little. Everyone loves tangerines, it seems. When we drag the crate in eyes grow wide. We have not misjudged our audience. It’s Sunday and it’s a Catholic orphanage, so of course they have lots of church. This is not a proper mass, as there is no priest to say one, but church is church, and the little chapel at the orphanage is full of boys and girls all saying their prayers and singing hymns. 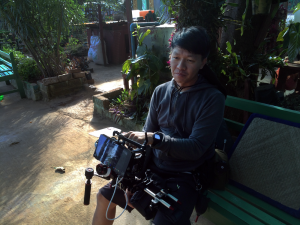 We set up to capture it all. The room is so small I recuse myself. 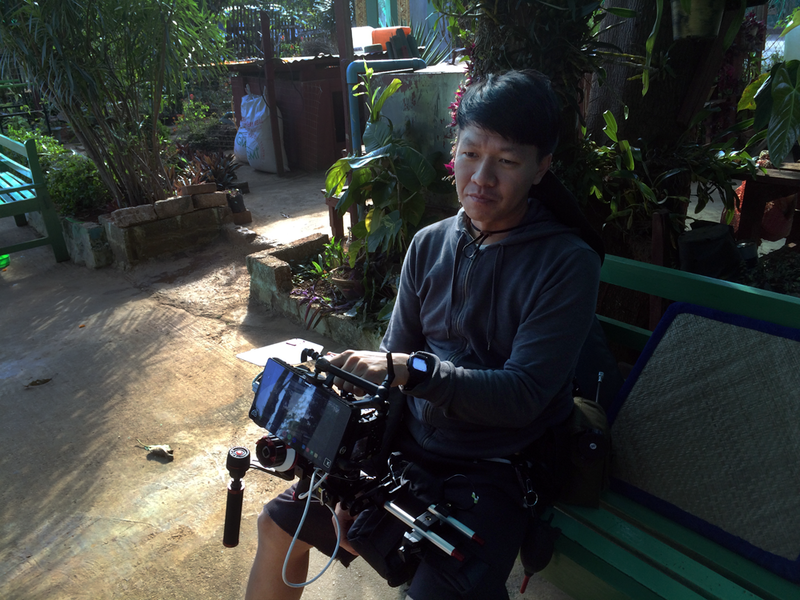 I have the stereo recorder on in the back, a mic on Tinmar Aung, and the boom outside the room for some perspective. Not much else for me to do except watch levels once in a while. I put the limiter on the stereo recorder again – I think that’s prudent for children belting out hymns. Fortunately for Gavin “Ode to Joy” is on rotation here. That gives me lots of time to think and to write in my little book. No matter what they shoot, I’ve got the sound covered, that’s for sure. With time stretching before me, my mind wanders a bit. The first thing that comes to mind is that Tinmar Aung’s life is very churchy now. We understand that her family was Buddhist. This must seem very strange to her – who is this Dead Jesus guy? It’s only been a year or so she’s been at the orphanage. Now, our li’l Tinmar Aung is a smart girl – and she is, overwhelmingly, a good girl. She may be a bit crafty at times, but we know she’s not trouble. So she seems to have adapted to the idea of sitting around and mumbling these new prayers. After all, it’s not much different from the Buddhist practice, it’s just a guy with a beard now. Prayer is prayer. I also think about her excitement at learning how to sew. In Myanmar lots of people would be very excited to receive a sewing machine is a gift. In fact, if we were to make a list of things that people here seem to be excited about, it might be, in this order, a motorbike, a sewing machine, and tangerines. There are other things, but these are surefire bets. Looking at the kids in their mismatched but colorful clothes, I also consider how people dress here. Though traditional costume is big in Myanmar (everyone seems to wear the longyi), the young and forward-thinking (like the citizens of Yangon) dress in American-style jeans or hip-hop knockoff clothing to show their break with old ways. These ways are also identified with poverty and backwardness and agrarianism – Myanmar knows it’s not cool and it is pretty broke right now. I see a lot of this allegiance to the new, but I wonder – new what? Fashion logos? Chinese factory overruns of famous brands? I think a break from the Green Party – the Military – is also part of it. But the NLD seems to be primarily “not the ruling order” to most people here. Basically anything but “them.” One has big hopes for Myanmar. 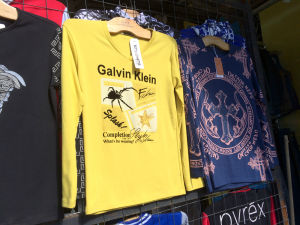 Speaking of knockoff Chinese brands, Minshi has found a shirt in the market that says “Galvin Klien.” We call Gavin “Galvin” for some time after that. Elsewhere this week terrorists attack in France and Mali. Western people are shaking their heads in disbelief. Here in Myanmar we can still see the rotting remains of colonial rule all around us. I’m reminded that 50 years ago the world seemed much the same as it does now – the people in French and British colonies were revolting, and people thought the world was falling apart. The old order was falling, and “terrorists” in France’s African client states were making everyone feel unsafe. So it will be with Muslim countries breaking from their overlords and casting out the meddling governments of nations like ours. Because one of the big incentives for revolt is that the people are miserable. Hezbollah doesn’t just perform military operations – they feed people. And though ISIS is twisted and ultimately serves only its leaders (comfy life if you are the despot), people do not follow ISIS in order to be slaves – they follow it hoping the new rule will be based on some kind of principles – even perverted religious ones. Maybe especially religious ones, because the belief is that religious order will be beneficial to most people, and will be more fair. It may allow them to thrive. And at some level everyone is just trying to survive and take care of themselves and their families. Thus the grand view of quite a bit of history seems to boil down to one thing: those in power wish that the rest of us do the work and give them the profits. Religion and patriotism are used to keep us doing that. But eventually the people wise up and realize they have nothing. So they revolt. Sadly, this usually means a new set of people are in charge and they begin abusing the people. Lest you think that my time waiting for church to be over has got me advocating some kind of radical hippieism, a kind of noble savage idea that we should all throw away our civilizations and our money systems, it may be necessary to pull back on this. In the US we may live in a crooked system, but it’s a rich system, and the standard of living is much higher. And what we call “standard” is just that – the average American can grow fat and unhealthy in ways the Burmese would have to actually spend fair amounts of money to do. Money may make the world go around, but it’s also part of the condition of being alive where human beings are concerned. It isn’t the money that’s the problem, it’s the distribution – as always. Consider this. Sister has been generous with time and resources of the orphanage, but are we not also giving her a massive donation? So the cynic may say she’s sold us Tinmar Aung and the other orphans, or at least put them on rental to the production for a fee. That is certainly one way of looking at it, and we’ve all considered this. But is it not also true that Sister is pretty selflessly taking care of 58 children no one else will care for? Does she get a fat salary for doing this work? And isn’t she doing a much better job of raising them so they can have happier, more productive lives? And doesn’t this endeavor require cash, as all endeavors do? The practicality of getting “good works” done and the commitment to social issues is the sole reason I could never outright condemn the Catholic Church. Protestants – well the field is wide open here – I’m sure some do good in the same way. It’s hard to say with so many Protestant ministers being hucksters and shameless charlatans. Of course the RCC has had big troubles keeping the Padre Pederasts safely hidden while abused children grow up irreparably damaged. I’m not giving them any kind of free ride here without considering all the issues. Dogma and mysticism be damned. Good works are always good works. Oh my gawd, Gavin and Sean are still in there. They have no idea how long this praying could take. There’s only one door out for them, and I’m sitting in the room adjacent, so I should know if they leave, though I’ve had no indication that they’re still in there. I’d poke my head in, but I might ruin a shot. Best to stay put. The recorder says we’re into it 45 minutes. More importantly, I’m trying hard not to cough. I’ve been officially sick since day three, so we’re coming up on a full two weeks of sick. The big problem is that I can feel the fluid in my lungs building up but not getting coughed out. If I do cough, it will end up on the track for certain – lucky that some of the kids have a cough too. So mine might pass for theirs. I can let one go – like sneaking a fart and hoping no one notices. I’ll be better off doing that than drowning in my own effluvia. But what is taking them so long? 50 minutes in – how much can that SSD card hold? Plus, I’m falling asleep. 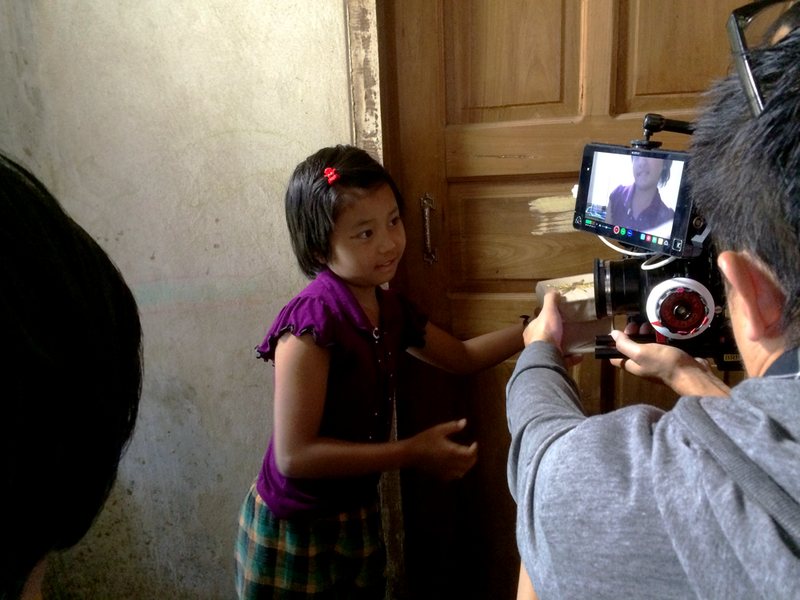 Finally the praying ends and next we do a scene with Tinmar Aung finding the marble in front of the orphanage. Later we see her going to store it in the treasure box Gilbert had left for her. The dormitory where she sleeps is big and open, but the closet area is a series of small shelves terminating in a kind of cramped cubbyhole. The scene takes a long time just because it’s hard to get everyone in there. Since I have a mic on a pole it’s fairly easy for me to stick it in from above. But Gavin and Sean are in there with Tinmar Aung, and they are all breathing down each other’s necks. Tinmar Aung reveals to us through John that she’s getting teased at school for being an actress. Teased here at the orphanage too, somewhat. “It’s inevitable” says Gavin. He’s right, but we still feel bad. We hope the excitement of the Balloon Festival covers this whole thing up, and kids have way more to talk about than Tinmar Aung’s acting debut. The Balloon Festival is kind of like Halloween here, with kids begging for candy and everything. Hopefully Tinmar Aung’s life will get back to normal when we leave, but no one can say for sure. When the kids eat their dinner we’re finally struck by how substantial but spartan their meals must be. No one seems wanting, and they all eat their fill. But it’s a heap of rice and maybe some condiments. Nowhere near the meat and fish festivals we’ve been enjoying. Noodles are special. Tangerines are a real treat. 58 children. You can’t be asking 58 kids if they want mac and cheese, pizza, or chicken fingers for lunch. You’ve got to line them up in a dining hall and scoop out rice from a giant container. If we’ve done nothing else for Tinmar Aung we have increased her food vista by incredible amounts. 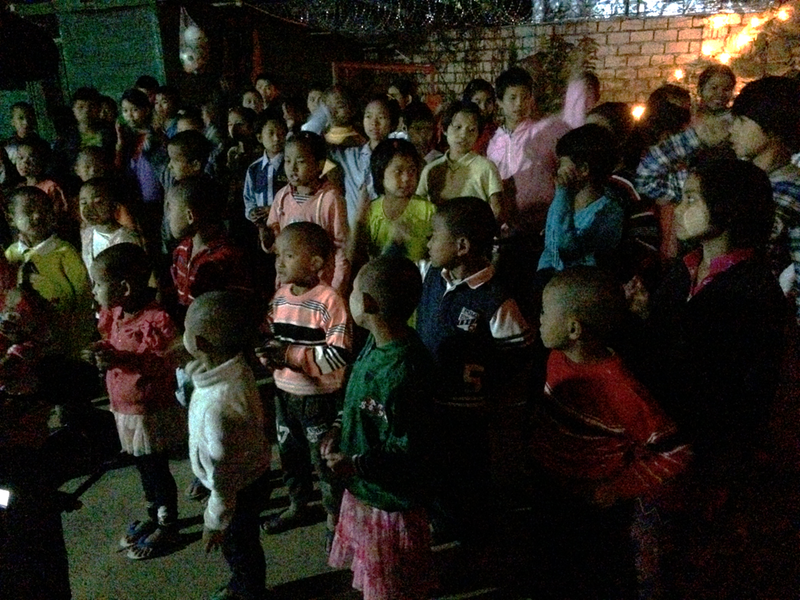 The sun sinks in the sky, and it’s time for a lantern lighting at the orphanage. 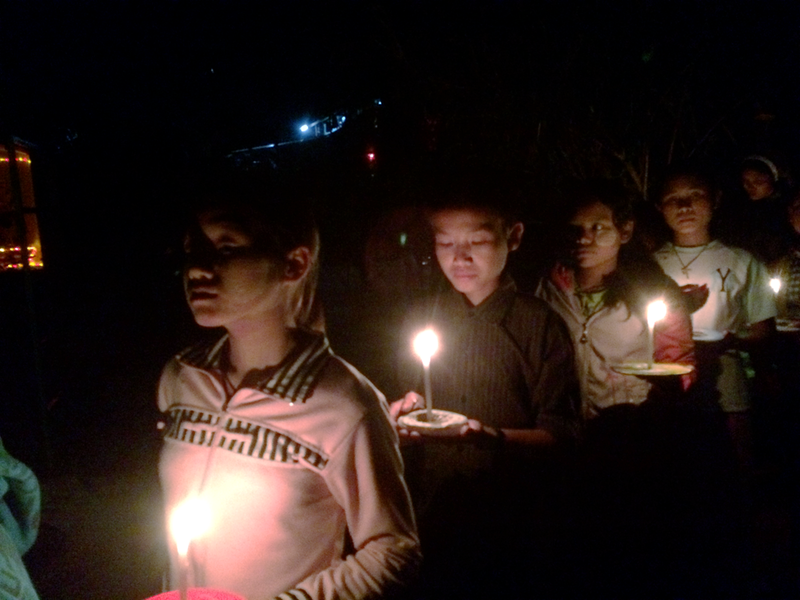 The Buddhist lantern festival, from which the Pyin Oo Lwin Balloon Festival is derived, is not a Christian holiday by any means. But neither is Halloween (much to the chagrin of idiot preachers) and we still celebrate that in the US. You get the feeling that so much of the Buddhist tradition is embraced by the Burmese Catholic Church simply because it is history and tradition. And what could be bad about lighting pretty lanterns? There is a funny moment in which the kids are trying to bend some heavy floral wire into a hook shape for the lanterns. Of course I pick up the pieces and wrench them into shape immediately. Of course – I’m a grown man. The look I get from our favorite tomboy is one of surprise and total admiration that I can bend the heavy wire so quickly. She hands me her piece. As night falls the orphanage is beautiful, with the quiet children shuffling around the courtyard, handing Sister the handmade paper lanterns to light and hang. The sound is crap. I leave Gavin and Sean to do whatever they like and I record the eerie and wonderful sounds of the kids whispering to each other in the dark. On the way home we ask John about Tinmar Aung getting teased at school. He and Salai both think maybe Tinmar Aung is exaggerating a bit. She’s telling her stories and other kids might take it as bragging. She may even be bragging – we don’t know. They both think she’s not only strong enough to handle it, but that it’s most likely not that bad. They’ve talked to her about it.